We realize that, although we are doing our best to hold a “green” event, some attendees prefer to print out a paper copy of the Annual Meeting Book. If you encounter problems printing the document found at the link on the button, and IF you have Publisher on your device, CLICK HERE for a more printer-friendly book. 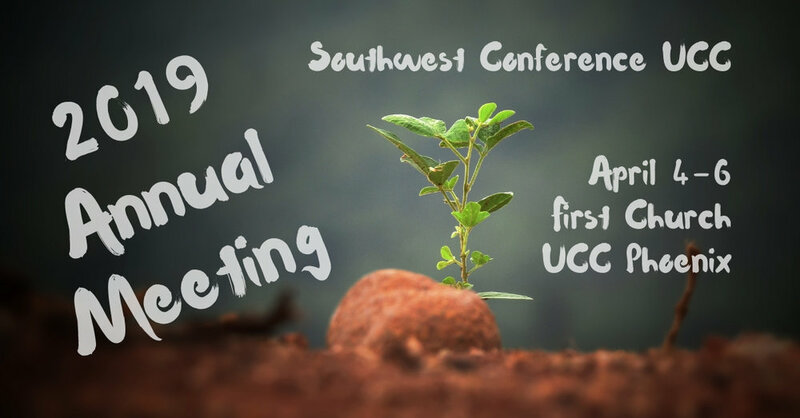 Online registration for the 2019 Southwest Conference UCC Annual Meeting has closed. If you still wish to attend, registration will be available at the door for $115 on Thursday and Friday morning during event check-in; see schedule for exact times. FRIDAY EVENING’S BANQUET HAS SOLD OUT! If you're being recognized at the Annual Meeting banquet and haven't registered, please contact Barb Doerrer-Peacock ASAP. DELEGATES: Churches with 500 members or less may have FIVE delegates. Ministers with standing in the SWC, members of the SWC Executive Board, and General Synod Delegates are Delegates in their own right. Our block rate is $134/night + taxes (includes full breakfast buffet). SOLD OUT - Block rate cut-off was March 3rd. To review information and make reservations, click HERE. Or call (602) 343-0006. HOME HOSPITALITY: If you require home hospitality, please select the appropriate option when registering for the Annual Meeting. Event Staff will follow up to confirm details upon request. For additional information, contact the SWC office. TRAVEL COST REIMBURSEMENT: Conference Delegates and eligible* Clergy with Standing may apply for travel reimbursement of up to $225.00. (*Pastors who have travel reimbursement in their Call Agreement are not eligible to apply for Conference travel reimbursement.) See the Expense Voucher form in the Annual Meeting packet or download and print a copy here. RESOLUTIONS: In accordance with Annual Meeting Standing Rule; resolutions may be submitted to the Conference at Annual Meeting. Resolutions must be received in writing to the SWC office no later than 3/13/19 to be submitted before the Executive Board. PARKING: Limited parking is available at the host church. We encourage you to use the light rail. Parking alternatives include the public lots at Burton Barr Central Library, and at the Phoenix Center for the Arts located at 3rd St. and Moreland Ave. Spoiler alert: This year’s check-in SWAG is special! See why. MEALS: After such a wonderful experience last year, we’ll continue the partnership of local businesses and food trucks to offer lunches for the 2019 Annual Meeting. You’re invited to choose and purchase items based on your dietary and budget preferences. Food trucks will be at the church with lunch for purchase on Thursday and Friday during the scheduled breaks for lunch. Menus can be found HERE. The banquet dinner will be held at Beatitudes Campus on Friday evening. Costs associated with the banquet are included in your registration fees. FRIDAY EVENING’S BANQUET HAS SOLD OUT! If you're being recognized at the Annual Meeting banquet and haven't registered, please contact Barb Doerrer-Peacock ASAP. Closing worship on Saturday will be such a celebration! See why and preview the bulletin here. This is an interactive map. Click the box with the arrow on the upper left for directions from one venue to the next, and other info.